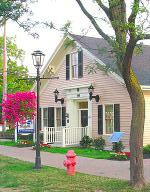 This link will take you to the Lewiston Gallery of local photographer, Bill Carpenter of De’Carr Studio (716-754-2731) that includes categories of the Museum Re-Dedication, the Frontier House, Christmas Walk 2008, Center Street and the Scarecrow Festival 2008. West Village, properties WEST of 4th St.
North 3rd & Center Streets. Known as Barton Hill. Built in 1815 by Benjamin Barton. Major Barton built his first home here in 1807 when his firm, Porter, Barton & Co. acquired the exclusive lease on the portage and landings at Lewiston and Ft. Schlosser in Niagara Falls. During the War of 1812, American troops were camped on the grounds and cannon were installed on the west lawn facing Queenston, across the river. The estate was burned to the ground when the British raided Lewiston on December 19, 1813. In 1814, Barton received a commission from President Madison as Deputy Quartermaster General. He re-built his home in 1815 when he returned after the war, where it remains standing today. It is presently the home of the Finkbeiners. Work continues to restore the home to its original glory. 469 Plain Street. 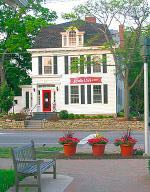 The Lewiston Historical Museum. The Rev. 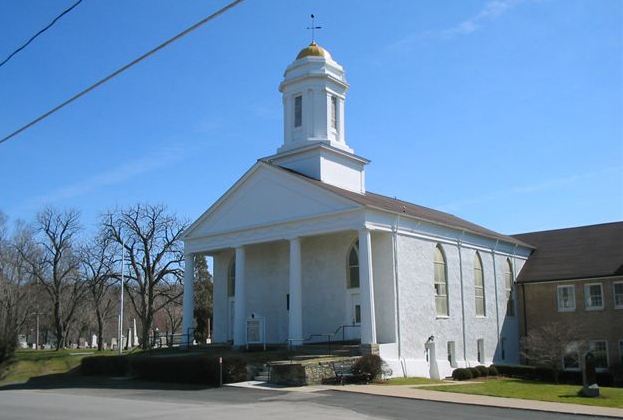 David Smith and followers from the First Presbyterian Church formed the Episcopal Church in 1836. The building was erected in 1835-6. Records from 1837 and 1841 state that the minister officiated at burials listing a “child of a stranger” and “a stranger.” The word “stranger” was used by those in the Underground Railroad to describe slaves in order to conceal their identity from the general public and bounty hunters. This would indicate that the Rev. Rufus Murray was an active participant. The church was a very popular place to be married and Jenny Lind, known as one of the world’s most renowned singers of the 19th Century, was said to have witnessed the marriage of her maid here. 433 Center Street. Known as Apple Granny. Built in 1869 by John Fleming, though reports exist that it was built up to 10 to 20 years earlier. Fleming was a tanner and currier who arrived in Lewiston in 1842 from Ireland and had built a tannery on Seneca Street in 1850. He built this general store as his “retirement” business. After 1902, it became Helms’ grocery store. In the early 1970s it was converted to restaurant which continues to thrive today. 460 Center Street. Known as the Frontier House. Built in 1824-5 by Joshua Fairbanks, Benjamin Barton and son, Samuel. 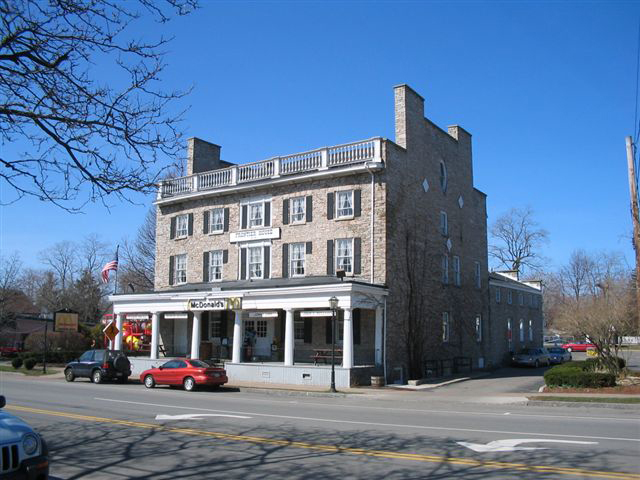 The Frontier House was once recognized as the finest hotel west of Albany, and is Lewiston’s premiere historic landmark. Stage coaches once thundered up to its doors when it served as a stop when Lewiston was the center of the “Great Overland Route Across the Continent.” In those early days, Lewiston’s population was more than Buffalo’s. The Frontier House is constructed of stone from the Bay of Quinte at the Northeastern end of Lake Ontario. 18 men worked 18 months in laying up the solid stone 30 inch walls. In 1826, William Morgan, the Masonic traitor, was brought here by stagecoach. He changed coaches and continued from here to Ft. Niagara. The original coach he arrived in remained for years behind at the Frontier House because people feared to move it, lest they be implicated in the abduction plot of Morgan. The coach decayed where it came to rest and no trace of it remains today. Historic guest list includes: Gov. DeWitt Clinton; Edward, Prince of Wales; James Fenimore Cooper; Charles Dickens; Jenny Lind; Henry Clay and John L. Sullivan. The last use of the building was an historic McDonald’s Restaurant, but at present, it stands empty. 467 Center Street. Built in 1838 by Benjamin Cornell. One of Cornell’s many businesses, it has been commercially used ever since. Once a bowling alley, it served as the library (1901-8). Three specialty shops now occupy the structure. Cayuga & South 5th Streets. First Presbyterian Church and Village cemetery 1826-35. Formed in 1817. The cornerstone laid in 1835. The rear wing was added in 1953. The west side annex was constructed in 1965. This church played a prominent role in the Underground Railroad and a sculpture in front of the church commemorates the site. The graveyard on the east and south sides of the church is the resting place for many of the early settlers and citizens of Lewiston. Veterans of all wars are buried there. 115 South Water Street. Formerly known as Angler’s Retreat and the Riverside Inn, it was built in 1871 by Philip Pitz. This establishment sits high atop the Niagara River’s edge and offers visitors a spectacular panoramic view of the river and Canada. A long time hotel for fisherman, the structure has survived three Niagara River ice jams. In 1909, the ice jam was 64 feet high with ice up to the first floor. It is now known as the Water Street Landing, and it hosts a restaurant and is home of the “Whirlpool Jet Boat Tours”. North Water Street. Known as The Silo. Today, it’s a restaurant with a commanding view of the Lower Niagara River. But it was the original coal tower for the Canadian Steamship Lines. This structure was the only thing remaining of the wharf after the 1938 ice jam. Below The Silo, you’ll see Lewiston’s public boat launch, a fishing pier and the Lewiston marina. 65 Center Street. Known as the Trafford Mansion. 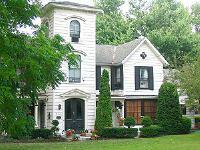 Built in 1840 by James Trafford, Maryann Cornell Trafford and her father, Nelson Cornell. Nelson Cornell, followed by his son, Hiram, was an enterprising merchant, hotel keeper and owner of one of the stage coach lines. 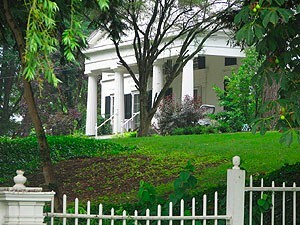 The Trafford Mansion is one of Lewiston’s landmarks and is an excellent example of Greek Revival construction. 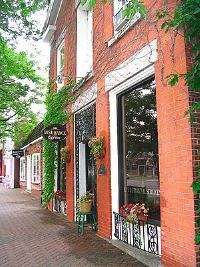 In addition to being a residence at various times, the mansion has been the St. Elmo Hotel, a tavern, The Wilson Inn and a restaurant. The tavern was opened in the lower level on the river side, probably the original stable. As a tavern, it has been known as The Bucket of Blood and Ma Jumps, because Ma had to jump and grab the coins tossed on the bar before Pa could pocket them for his own use. It was also known that men were often “shanghaied” there for service in the Merchant Marine. Originally, the kitchen was probably in the basement where a fireplace, apparently the only working one, was discovered in later years behind the wall of the tavern. A decorative fireplace in the living room is surrounded by built in bookcases. Although there is a central chimney remaining, an additional one on the back of the mansion was removed at some time. 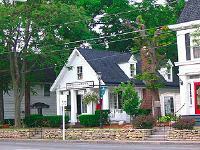 Today, it serves as a salon and spa for the Barton Hill Hotel, located across the street. You can see more exterior and interior photographs here. Lewiston Landing site. Area known as Artpark. One of the earliest developments in the area, dating back to 1615. French priest, Fr. Louis Hennepin joined LaSalle here in 1678 to explore the area, sail the Great Lakes and discover the northern part of the Mississippi River. A chapel and fortified cabin later became Chabert Joncaire’s Trading Post in 1721. It is now Artpark, a state cultural venue on 172 acres. 3rd & Center Streets. Known as Fairbanks. Built in 1815 by Joshua Fairbanks. Harriet Van Cleve, who inherited the house from her grandfather, Joshua, lived here with her husband, James Van Cleve. After a long career as Captain of several lake ships, Capt. Van Cleve retired here in 1861 to write his three volume history of the Great Lakes ships and a history of Lewiston. Private residences currently. You can see current pictures here. Onondaga and North 4th Streets.Known as the Red Brick School House. Built in 1901, it was rebuilt in 1905 after a fire in front section. A gymnasium was added in 1927. 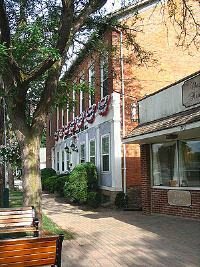 Currently, it houses the Lewiston Village Hall and private offices. 300 Onondaga & North 3rd Streets. Known as the John Lasher House. Built in 1834 by John Lasher who helped found Lewiston’s Episcopal Church in 1835. He was an agent for Nathaniel Cook. There were home additions built from 1834 to the 1870s, with Victorian elements added by Benjamin Barton’s granddaughter, Agnes Gillman. Its currently a restored Victorian B & B. 4772 Lower River Road. Known as Tryon’s Folly or The House of the Seven Cellars. Built in 1830 by Amos Tryon. The original home was to have housed business and a new homestead for his wife Sally Barton, Benjamin Barton’s daughter. However, she refused to move from their home on 4th and Center Street, and it was called Tryon’s Folly after that. Interestingly enough, the home did not go unused. Amos’ brother, Josiah Tryon, became the volunteer leader of the local Underground Railroad activities, and helped thousands of fugitive slaves escape to Canada and freedom. Josiah was a local tailor, and used the home as a staging point to smuggle slaves across the river. The home has a multi-leveled interconnecting basement, containing several separate rooms, that could easily hide slaves. 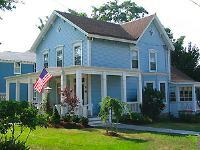 The original home had a fire in 1900 and a new structure was built on old foundations in 1915. It is a private residence now and not publicly accessible. The basements still exist and you can pictures of the basements on our Freedom Crossing page here. 4421 Lower River Road. Known as Stella Niagara Educational Park. Built in 1830 by Calvin Hotchkiss. The bachelor merchant/farmer erected the red stone home as his retirement dwelling on several hundred acres of prime land. One year, Mr. Hotchkiss was asked by the town assessor to list his assets. Mr. Hotchkiss replied, “A ram, a goat, and a black cat.” He was taxed for $5,000. The next time he was assessed, the same question was asked, and the same answer was given. His taxes increased another $5,000, a huge sum in those days. When he died in this house in 1866, his estate was estimated at $500,000. 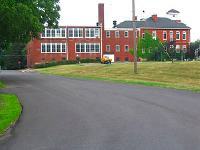 The Sisters of St. Francis of Penance and Christian Charity operate the expanded site as a private school and convent. Pottery shop is open to the public. Across the street from Stella is “The Meadows” on the Lower Niagara River which is home to the “miracle” Chapel on the banks of the Niagara River. It’s referred to as a miracle because it apparently cured the man who built it, and also survived a 50 foot wall of ice surrounding it during the ice jam of 1955 without a scratch. Stella’s history was recently featured in our placemat series. You can see more here. 411 Center Street. Formerly known as The Red & White Store. It was built in 1863 by Moses & Abraham Baristo. On land deeded from Amos Tryon to the Baristos, a general store was built. “Uncle Abe,” a bachelor, was a merchant in business for 30 years after migrating from New Hampshire with his brother. 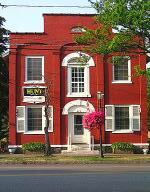 The structure was converted to law offices after many years. Today, it is an insurance office. 419 Center Street. Known as The Silver Dollar Saloon. It was built in early 1800s by Aloysius Snyder. It has housed a number of businesses including a saloon, an ice cream parlor, a rooming house, a drug store and a dress shop. It is now a specialty bake shop. 441 Center Street. Built in 1828 by Calvin Hotchkiss. Built as a General Store, the large upper level central door was used to load bulk merchandise by block and tackle. O. P. Scovell, prominent lawyer, had offices on the second floor. Presently used as professional offices. 457 Center Street. Built in 1850. Williams Alden’s shoe store. From the 1920s through 1940s it was Mr. Carrel’s Grocery Store. Reverted to another shoe store afterward. Site of the first telephone office in the Village. It is a restaurant today. 476 Center Street. Known as The Little Yellow House. It is reputed to be the oldest standing structure in Lewiston, built in 1816 by Peter Porter and Benjamin Barton. Used by Robert Fleming as a law office, it was deeded upon his death to Fleming’s heirs by the Porter-Barton Co. It has remained largely unaltered for over 180 years. It is presently a chocolate shop. 479 Center Street. Built in 1838 Calvin Hotchkiss. One of the many structures built and operated by Hotchkiss, it also has a door above the center entry for loading merchandise in frontier days. It currently is a real estate office. 500 Center Street. Built in 1845 by Dr. Edward Smith. Born in 1821, the son of Dr. Willard Smith, Edward lived and practiced here for his entire life. Likewise, Dr. H. Selzer used the building for his home/office until his death in 1995. Original carriage steps still in front. Today, it is First Niagara Savings Bank. 505 Center Street. Known as The Long House. Built in 1815 by Judge William Hotchkiss. Upon his return from the War of 1812, the judge built the home and connecting stables. It was the center of social activity for Lewiston’s prominent families. From 1962-90, it housed the Public Library, now located on South 8th Street. It serves as a real estate office today. 525 Center Street. Known as The Short House. Built in 1818 by Judge William Hotchkiss. Used as his law office, it features a connecting courtyard to the Long House. Today it is a chiropractic office. 535 Center Street. Built in 1820 by Judge William Hotchkiss. Built as a store, Calvin Hotchkiss managed it for his brother. It was the second home of the library from 1908-1962. Presently it is a bakery. 605 Center Street. Built in 1870 by William Parkinson to be used as a manse for the First Presbyterian Church. 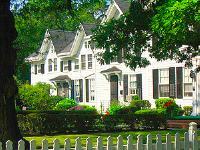 It was once surrounded by large elm trees until the 1950s blight. It is a private residence today. A porch was added in 2005. 620 Center Street. Known as Lewiston Manor or Hennepin Hall. Built in 1834 by Sherbourne Piper, Esq., who was a teacher at the Lewiston Academy and Lewiston’s only attorney at the time. Piper and his wife Martha Godwin built the grand home after arriving from Dartmouth College, New Hampshire. Piper later became a state senator. Presently it is the rectory for St. Peter’s R.C. Church. 625 Center Street. Known as The Kelsey Tavern. Built in 1820 by Thomas Kelsey. 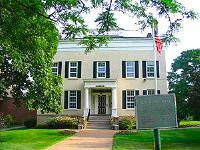 This stately structure hosted Revolutionary War hero, French General Marquis LaFayette on his tour of the region. Lafayette was also reunited with his Indian guide, Nicholas Cusick here. Many gala festivities were held here. Presently it serves as a real estate office. 703 Center Street. Built in 1820 by Dr. Willard Smith. 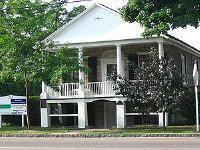 When Dr. Smith’s tour of duty in the 1812 war ended, he built his home and medical office. His son, Edward, was born here. Since then, several artists have occupied the structure and today it is a cafe. 700 Center Street. Built in 1830 by Dr. Gideon Frisbee. Another home/office for a doctor, the building also housed a drug store and post office in the east wing, which was added later. It is an apparel shop today with a private residence. 712 Center Street. Known as the Universalist Church. Built in 1837. The church also shared services with the Methodist and Roman Catholic congregations. Around 1900 it became a social hall and roller skating rink. Currently it is an apartment house. 736 Center Street. Also known as Moss Hall or The Opera House. Built in 1832 by Joseph Hewitt. This was a multipurpose center where dinners, lecture series and dancing classes have been held over the decades. The Colonial Ball, a costume affair, was an annual event and attended by all the prominent residents. The west annex was added in the 1920s and the first floor became the telephone office in 1926. The I.O.O.F. has held meetings in the building since 1872. 742 Center Street. Behind the modern additions which border the sidewalk on Center Street, there is a hidden brick building. This stone house is somewhat of a mystery and the name of the builder and the year the home was built is unknown. A cornerstone is inscribed “JBF 1811”, however no records exist of a person in Lewiston with those initials. Some historians believe the cornerstone was added later, which would indicate the home was built after that time. If the cornerstone was actually true, it would make this house the oldest standing structure in Lewiston and, other than Hustler’s Tavern, the only building to survive the British attack of 1813. 755 Center Street. Known as The First & Last Chance Saloon. Built in 1820 by Bates Cooke. The son of Lemuel, Bates was a lawyer, a U.S. congressman and later, the New York State Comptroller. 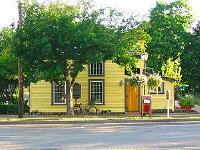 Replacing the 1813 burned wood frame dwelling, it later became a tavern after Cooke’s death in 1841. In 1954 it was restored as an art gallery. It is a commercial site today. 810 Center Street. Also known as The Clarkson House Restaurant. The Clarkson House was one of the first buildings constructed after the burning of the Village of Lewiston by the British during the War of 1812. It was built in 1818 by Jacob Townsend who came to Lewiston from Connecticutt in 1810. Over the years, restoration has revealed many interesting facts about construction techniques of the early 1800s. Timbers in the primary structure are mortised and pinned, and the absence of nails is remarkable. The few discovered are square and handmade. The posts and beams are original, hand hewn of oak and chestnut. As the hand-made brick and “rambling” construction indicate, the chimney is also original. The builder, Mr. Townsend, was a shipper of salt, furs, pork, potash, feathers and grindstones. He operated from Lewiston, Black Rock (Buffalo) and Oswego. He also helped found The Lewiston Academy which stood across the street in what is now known as Academy Park. 855 Center Street. Location of Academy Park, and the site of TheLewiston Academy (no longer standing.) The Academy was a large four story building constructed in 1824-1825 by F. Stewart, and was recognized at the preeminent private school in Western New York. It has a large library, excellent chemistry labs, endowed by the Lewiston Masonic Lodge, and an observatory on the roof. The majority of the teaching staff was from Dartmouth College in New Hamphsire. Also teaching there were the poet Saxe, and the scientist Odonathus Hill. The 150 students came from Canada and Western New York. In 1826, the State Legislature granted a petition from Lewiston residents requesting the proceeds of the Queenston-Lewiston ferry be paid to the school. The Academy prospered until the Canadian students withdrew during the 1837-38 MacKenzie Rebellion, and with unstable economic conditions locally. In 1851, when the bridge between Lewiston and Queenston opened, the ferry service was discontinued, and financial support ceased. The Academy was forced to close. Reopened briefly in 1855, and again in 1867, the building remained vacant until it was demolished in the 1930s. The original cornerstone, which was laid with full Masonic honors, stands on a pedestal in the northeast corner of the park, which is used throughout the year for sports and cultural activities, and the Lewiston Kiwanis Peach Festival in September. You can see a picture of the old Lewiston Academy on one of our historical placemats here. 155 S. 5th Street. Built in 1817 by Rev. David M. Smith, first minister of the Presbyterian Church in 1817, Smith built the south wing. Smith was an active fund raiser for church and the Academy, and he became the first school principal in 1826. Rev. 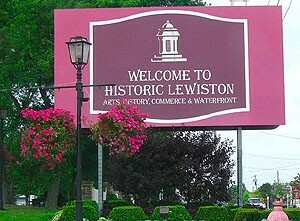 Smith left Lewiston in 1829. A private residence currently. 400 Plain Street. Known as the Kelly House. Built in 1852 by George Worden. This formidable structure with its cupola and veranda was occupied by the Kelly family (1895-1961). 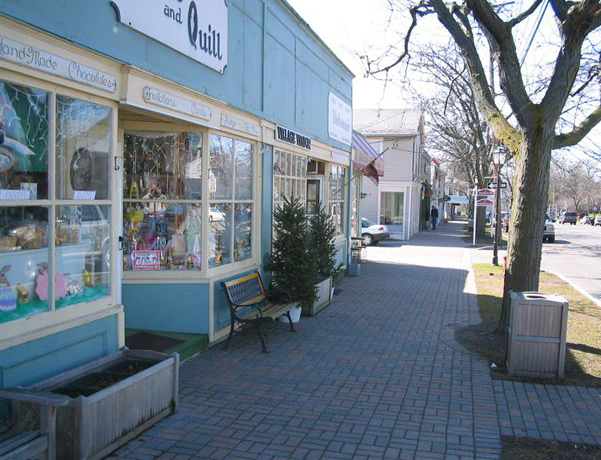 Over the years it has housed antique shops, gift stores and a B & B. Currently, an apothecary and gift shop. 430 Plain Street. Built in 1830 by Calvin Hotchkiss. The land was purchased from Robert Troup in1825. Hotchkiss built another home adding to his extensive holdings. He also had an interest in the Mt. Vernon Glass Factory and carried various goods such as wood, dishes, windows, stone, grain, hay, watches, cows and canal boats. He died in 1866. It’s a private home currently. 442 Plain Street. Built in 1828 by Josiah Tryon, the volunteer station master for the local Underground Railroad. The original part of the home is in the rear. In an extension, there was a cooperage where wood barrels and casks were made and repaired. 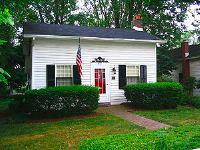 It is not known if Josiah Tryon ever lived here, however, he conducted his tailor shop on Center Street in a building that would be directly behind this home. 451 Plain Street. Built before 1829 by Leonard Shepard. This home was moved from Center Street on skids in winter. The lovely old-fashioned grounds are still maintained. Privately owned today. 466 Plain Street. Built in 1862 by Benjamin Cornell. Cornell became the Village President in 1872. His dry good store was directly behind this property facing Center Street. The back section of this home was originally built in 1840 by John Bement. 481 Plain Street. Built in 1825 by James Going. The only square front house in the Village, the lower level housed a cobbler shop. The lower rear level may also have been a tavern. Original center section is post and beam, common in 1700s construction. It is private residence now. Niagara Street at Tuscarora Street. Known as the site of Oak Hill. Built in 1834 by Seymour Scovell, a custom’s collector, who held many parties and dinners for his friends and associates here. Niagara Street was cut from a direct line between the home and the Frontier House on Center Street, where Scovell was a frequent and well liked patron. Before a fire destroyed it in 1969, it was known as Starkweather’s Mansion. Teenage boys used to frequent the grounds which were considered spooky and haunted. Author Margaret Laurie, who wrote the book, Lewiston: Crown Jewel of Niagara, stated, “Perhaps the old and reputedly eccentric Starkweather sisters, Seymour Scovell’s granddaughters, contributed to its sinister reputation. At least one of their guests from New York City found them peculiar. He was Joseph O. Kesselring, a published playwright but hardly a famous one until he visited the owners at Oak Hill and wrote a new drama, which he set in New York City rather than Lewiston. On April 21, 1974, an article in the Buffalo News identified the Starkweather sisters as models for Kesselring’s ‘homicidal little old ladies of Arsenic and Old Lace,’ and the set where they poisoned visitors was the Scovell Mansion of Lewiston. In writing about the strange, rich old women, Kesselring produced a hit play.” The estate was razed in 1969 after fire gutted the Greek revival stone mansion. Only the foundation remains, and the property is now owned by the State of New York as part of Artpark. 401 Cayuga Street. Built in 1838 by Dr. Darius Shaw. Shaw married one of Samuel Barton’s sisters. Their daughter, Harriet, married James Van Cleve and lived here before moving into the Fairbanks Mansion on South Third Street. It is still a private home. 475 Cayuga Street. Built in 1840 by Alexander Lane. Built as a summer boarding house for young ladies, the east wing is the original part of the home. Each section has its own staircase to the second floor. A private home today. It underwent extensive renovations in 2004. 175 S. Fourth Street. 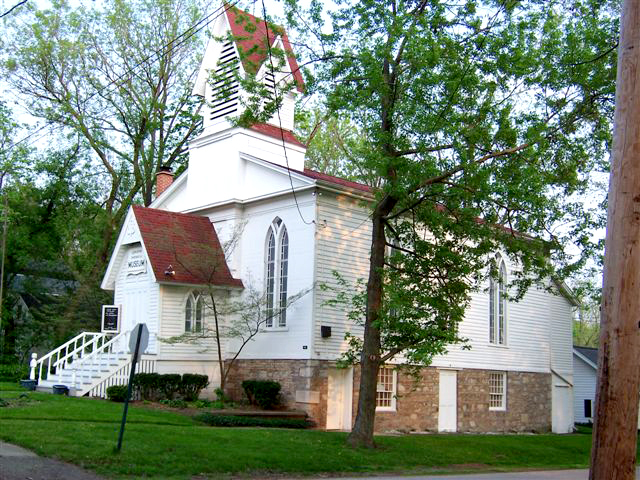 Built in 1830 by Guy Reynolds, who was first vestryman of Saint Paul’s Episcopal Church. This home, with its subsequent additions, is one of Lewiston’s many gracious houses. Reynolds worked to complete it in the summer of 1830 but died that fall at the age of 32 before he could move in. His widow and family then occupied the home. It is a private home today.